Margaret (Guthery) was born 1826 at Ballyvaughan, County Clare, Ireland. She went to work for a Mrs Murphy at Kilmore. 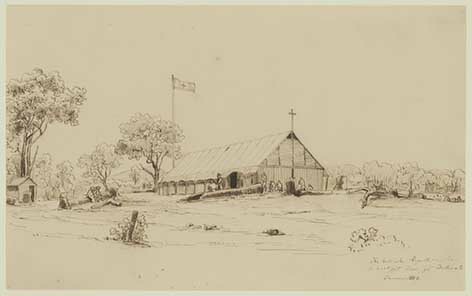 She married Dennis Kinnane at St Alipius Catholic Church, Ballarat on March 23 1853, when her usual abode was described as “The Eureka”. Margaret’s first son, John was baptised in April 1854 at St Alipius by the same priest that had officiated at her marriage. The sponsors were John McGrath and Honora Waters. She was recorded on the baptismal certificate as Margaret Guttary not Guthery, and her husband as Dennis Cannon, a “Gold Miner” at “Eureka”. Her second child, Bridget, was baptised on 19 January 1856 the sponsors being Anthony O’Loughlin and Margaret Finucane. Margaret and her husband, Dennis, later went to Fellmongers to live. Margaret and her neighbour, Mrs Hosking, were arguing about Margaret’s pigs escaping into her neighbour’s paddock. The argument was fuelled when thirty two fruit trees in full bearing were cut down in Mr. Hosking’s paddock. It was reported in the Ballarat Star as the Fruit Garden Outrage. Dennis Kinnane was charged, but later acquitted due to lack of evidence. A family group was living in Fellmongers. Margaret’s sister, Mary, who had married Martin Quin lived opposite the Kinnanes on the Brewery Tap Road. Martin Quin’s sister, who had married Michael Nestor also lived in the vicinity. Margaret and Dennis had the following children: John b. 27 April 1854 Eureka (married Elizabeth Haughton); Bridget b. 22 February 1856 Eureka (married Patrick Slattery); Thomas b. 31 December 1857 (married Jane Johnson); Coleman b. 1 July 1859 (married Emma Haughton); Peter (Cannan) b. 6 September 1861 Fellmongers Creek; James b. 1 September 1862 Fellmongers Creek (married Catherine Williamson); Dennis b. 22 September 1864 Fellmongers Creek (married Matilda Auld); and Patrick b. c1868/69 (died 1870) Dennis and Margaret later settled in Humffray Street, Ballarat East. Margaret’s husband, Dennis, died 19 September 1888 and was buried at Melbourne General Cemetery. Margaret died 16 July 1892 and was buried Melbourne General Cemetery. This page was last edited on 1 August 2017, at 06:37.